A vast bloom of toxic algae off the West Coast is denser, more widespread and deeper than scientists feared even weeks ago, according to surveyors. This coastal ribbon of microscopic algae, up to 64 kilometres wide and 198 metres deep in places, is flourishing amid unusually warm Pacific Ocean temperatures. It now stretches from at least California to Alaska and has shut down lucrative fisheries. Shellfish managers on Tuesday doubled the area off Washington's coast that is closed to Dungeness crab fishing, after finding elevated levels of marine toxins in tested crab meat. So-called "red tides" are cyclical and have happened many times before, but ocean researchers say this one is much larger and persisting much longer, with higher levels of neurotoxins bringing severe consequences for the Pacific seafood industry, coastal tourism and marine ecosystems. Dan Ayres, coastal shellfish manager for the Washington Department of Fish and Wildlife, said the area now closed to crab fishing includes more than half the state's 253-kilometre-long coast, and likely will bring a premature end to this year's crab season. "We think it's just sitting and lingering out there," said Anthony Odell, a University of Washington research analyst who is part of the U.S.'s National Oceanic and Atmospheric Association-led team surveying the harmful algae bloom, which was first detected in May. "It's farther offshore, but it's still there." Could 'the blob' be the culprit? 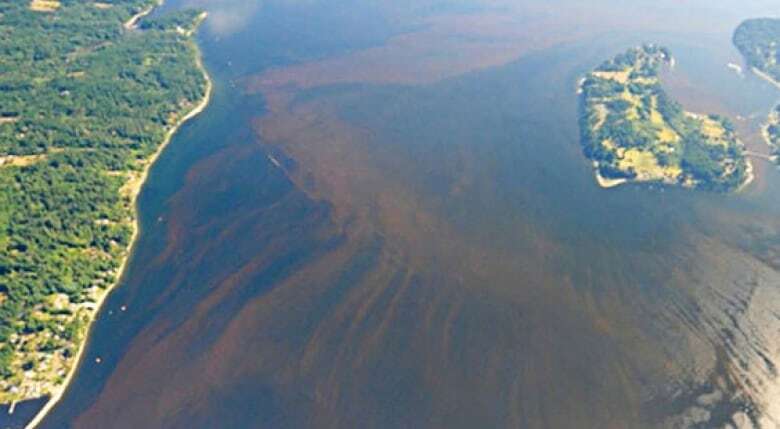 The survey data should provide a clearer picture of what is causing the bloom which is brownish in colour, unlike the blue and green algae found in polluted freshwater lakes. Marine detectives already have a suspect: a large patch of water running as much as 3 C warmer than normal in the northeast Pacific Ocean, nicknamed "the blob." "The question on everyone's mind is whether this is related to global climate change. The simple answer is that it could be, but at this point it's hard to separate the variations in these cycles," said Donald Boesch, professor of marine science at the University of Maryland who is not involved in the survey. "Maybe the cycles are more extreme in the changing climate." "There's no question that we're seeing more algal blooms more often, in more places, when they do occur, they're lasting longer and often over greater geographical areas. We're seeing more events than documented decades ago," said Pat Glibert, professor at Horn Point Laboratory, University of Maryland Center for Environmental Science. Odell recently completed the first leg of the survey, mostly in California waters. On Wednesday, researchers plan to continue monitoring the sea between Newport, Oregon, and Seattle. The vessel will then go to Vancouver Island, wrapping up in early September. 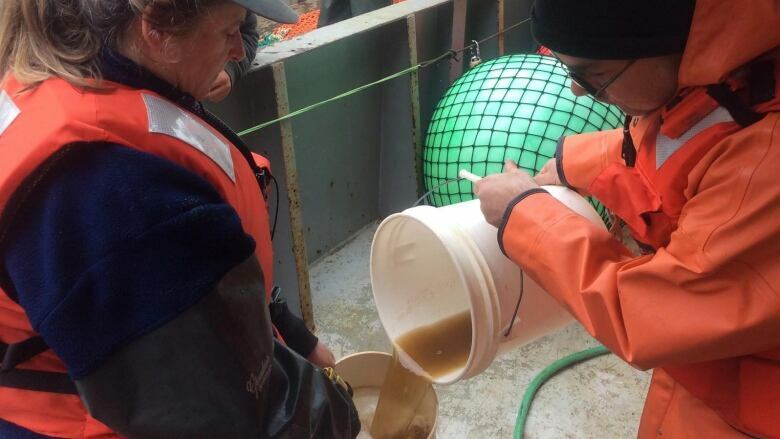 Another research ship is taking samples off Alaska. "It's an indication of an imbalance," said Vera Trainer, a research oceanographer with the Northwest Fisheries Science Center in Seattle. "Too much of any one thing is not healthy for anybody to eat." Trainer said this bloom is the worst she's seen in 20 years of studying them. Harmful algal blooms have usually been limited to one area of the ocean or another, and have disappeared after a few weeks. This one has grown for months, waxing and waning but never going away. "It's been incredibly thick, almost all the same organism. Looks like a layer of hay," said Raphael Kudela, a professor of ocean sciences at the University of California, Santa Cruz. "It's really working its way into the food web and we're definitely seeing the impacts of that," Kudela said, noting that sea lions are getting sick and pelicans are being exposed. And now that the Pacific is experiencing its periodic ocean warming known as El Nino, it may come back even stronger next year, he said. State health officials stress that seafood bought in stores is still safe to eat because it is regularly tested. While there have been no reports of human illnesses linked to this year's bloom, authorities aren't taking chances in fisheries with dangerous toxin levels. California public health officials have warned against eating recreationally harvested mussels and clams, or any anchovy, sardines or crabs caught in waters off Monterey, Santa Cruz and Santa Barbara counties. Other shellfish harvests are shut down along Oregon's coast. "This is really unprecedented territory for us," said Ayres.